We are privileged to have a wide network of corporate affairs and communications directors, CEOs, chairmen, HR directors and other business leaders. They generously give of their time and expertise to help us explore developments in corporate communications and the wider business world. 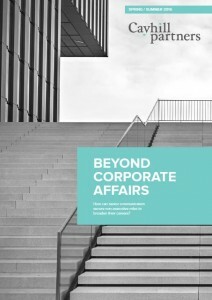 Our latest research is ‘Beyond Corporate Affairs; How can senior communicators secure non-executive director (NED) roles to broaden their careers?’ It investigates the career aspirations of today’s corporate affairs directors and asks why so few communications directors hold NED roles or go on to other leadership positions. The need for boards to better manage their corporate reputation and identify potential risks has never been more critical. Yet when looking at the make-up of today’s boards, particularly those in the FTSE100, non-executives with these very skills – those with corporate communications experience – are noticeable by their absence. The report sheds light on the situation and gives both communications directors as well as business leaders a unique insight into the topic. The publication includes an analysis of corporate affairs directors’ career aspirations, identifies the barriers stopping them securing NED and other leadership roles, outlines what FTSE chairmen think about the situation and features an action plan for communications directors wishing to take on other leadership positions.